Adrenergic bronchodilators is a class of medications that all student must learn and know in Respiratory Therapy school. To help with that, we created this study guide that is loaded with helpful practice questions that can teach you everything you need to know about Adrenergic Bronchodilators. So make sure that you go through these practice questions until the information sticks. Are you ready to get started? Let’s dive right in! 1. What is an adrenergic bronchodilator? It is an agent that stimulates sympathetic nervous fibers, which allows relaxation of smooth muscle in the airway. It is also known as a sympathomimetic bronchodilator or B2 agonist. 2. What happens during a-receptor stimulation? It causes vasoconstriction and vasopressor effect; in the upper airway (nasal passages), this can provide decongestion. 3. What is the asthma paradox? Refers to the increasing incidence of asthma morbidity, and especially asthma mortality, despite advances in the understanding of asthma and availability of improved drugs to treat asthma. 4. What happens during B1-receptor stimulation? Causes increased myocardial conductivity, heart rate, and contract force. 5. What happens during B2-receptor stimulation? Causes relaxation of bronchial smooth muscle, with some inhibition of inflammatory mediator release and stimulation of mucociliary clearance. Narrowing of the bronchial airways caused by contraction of smooth muscles. Group of similar compounds having sympathomimetic action and they mimic the actions of epinephrine causing increase HR, smooth muscle relaxation of bronchioles and skeletal muscle blood vessels. It is used for tachycardia, elevated BP, smooth muscle relaxation, glycogenolysis, skeletal muscle tremor and CNS stimulation. Duration is 1.5 to 3 hours and inactivated by gut/liver, heat, air and light. 8. What is cyclic adenosine 3′ and 5′-monophosphate cAMP? Nucleotide produced by B2-receptor stimulation. It affects many cells, but causes relaxation of bronchial smooth muscle. 9. What is a sympathomimetic? It produces effects similar to those of the sympathetic nervous system. 10. What is a short-acting B2 agonist? Albuterol, levalbuterol, or metaproterenol are indicated for relief of acute reversible airflow obstruction in asthma or other obstructive airway diseases like COPD. 11. What diseases are treated with long-acting agents such as salmeterol, formoterol, arformoterol, indacaterol, and olodaterol? The maintenance of bronchodilation and control of bronchospasm and nocturnal symptoms in asthma or other obstructive diseases like COPD. 12. What is racemic epinephrine? Used as in inhaled aerosol or by direct lung instillation and control airway bleeding during endoscopy to reduce airway swelling. It is used for the strong a-adrenergic vasoconstriction effect and for reducing airway swelling after extubation. It is also done during epiglottitis, croup, or bronchiolitis and to control airway bleeding during endoscopy. 13. What is the duration of racemic epinephrine? It is an ultra-short acting drug (duration less than 3 hours). 14. What types of drugs are albuterol, levalbuterol, and metaproterenol? Short-acting (duration 4 to 6 hours). 15. What types of drugs are salmeterol, formoterol, arformoterol, indacatferol, olodaterol? Long-acting (duration 12 to 24 hours). 16. What should be done by the respiratory therapist before a treatment? Assess the effectiveness of drug therapy b, monitor flow rates, perform a respiratory assessment, and assess pulse. 17. What should be done by the respiratory therapist during a treatment? Assess patient subjective reaction, assess arterial blood gases sat, and note the effect of B agonists. 18. What is a benefit of Xopenex? Does not affect heart rate. It is a long-acting inhalation solution given for COPD and has to be refrigerated. Arformoterol (nebulizer solution), duration: up to 12 hours, use: maintenance treatment of COPD and asthma not controlled by corticosteroids. 20. What is the FiO2 of room air? 22. What is the dose of Racemic Epinephrine? 23. What kind of adrenergic bronchodilator is racemic and epinephrine? 24. What are the brand names of albuterol? Accuneb, Ventolin, Proventil, ProAir, and Vospire. 25. What are the modes of delivery for albuterol? 26. What is the dose for SVN albuterol? 27. What is the dose for MDI albuterol? 28. What is the brand name of levalbuterol? 29. What are the modes of delivery for levalbuterol? 30. What is the dose for SVN levalbuterol? 0.63mg/3ml NS and 1.25mg/3ml NS. 31. What is the dose for MDI levalbuterol? 32. What kind of adrenergic bronchodilator are levalbuterol and albuterol? 33. What is the mode of delivery for arformoterol? 34. What is the SVN dose for arformoterol? 35. What are the brand names for formoterol? 36. What are the modes of delivery for formoterol? 37. What is the SVN dose for formoterol? 38. What is the DPI dose for formoterol? 39. What is the Brand name for salmeterol? 40. What is the mode of delivery for salmeterol? 41. What is the DPI dose of salmeterol? 42. What type of adrenergic bronchodilator are arformoterol, formoterol, and salmeterol? 43. What are the indications for adrenergic bronchodilators? Asthma, bronchitis, emphysema, bronchiectasis, and obstructive airway diseases. 44. What are the indications for short-acting agents? 45. What are examples of short-acting agents? 46. What are the indications for long-acting agents? Maintenance bronchodilation, control bronchospasm, and control nocturnal symptoms. 47. What are examples of long-acting agents? Salmeterol, formoterol, arformoterol, indacaterol, and olodaterol. 48. What is used to treat postextubation strider? 49. What is used to treat epiglottitis, croup, and bronchiolitis? 50. What is an ultra-short acting drug? Duration <3 hours. Example is racemic epinephrine. 51. What is a short-acting drug? Duration 4 to 6 hours. Examples are albuterol, levalbuterol, and metaproterenol. 52. What is a long-acting drug? Duration 12 to 24 hours. Examples are salmeterol, formoterol, arformoterol, indacaterol, and olodarerol. Potent catecholamine bronchodilator and stimulates alpha and beta receptors. It helps in vasoconstriction of peripheral blood vessels. 54. What are the side effects of epinephrine? Tachycardia, elevated blood pressure, tremor, headaches, and insomnia. 55. What is a characteristic of contact B-adrenergic agents? They offer less frequent dosing and nocturnal protection. B2-selective agonist (SVN and DPI), short peak effect 3 minutes, duration of up to 12 hours and used for: asthma, exercise induced bronchospasm (both 5yrs or older), and COPD. 57. What are the safety concerns of long-acting B2 agonists? Not to be used with a controller medicine, only by patients on low dose or medium dose ICS and should only be used short term and if patients are not controlled by ICS. 58. What does an a-receptor do? 59. What does a B1-receptor do? Increase HR and contractile force. 60. What does a B2-receptor do? 61. What is the purpose of continuous nebulization of albuterol? Management of asthma reduces the need for frequent therapist attendance and dose: 10-15 mg/hour. 62. What are the complications of continuous nebulization of albuterol? Cardiac arrhythmias, hypokalemia, hyperglycemia, and tremor. 63. What is good about oral delivery? Easy to use/short admin time/reproducibility and controlled dosage. The longer onset of action, systematic side effects, and loss due to the first pass of the liver. 64. What are the side effects of albuterol? 65. What are the two types of ultrashort-acting drugs involved with adrenergic bronchodilators? 66. What are the trade names for epinephrine? Primatene mist, adrenalin chloride, asthmahaler and medihaler-epi. 67. What is the onset, peak, and duration of epinephrine? Onset: 3-5 mins; Peak: 5-20 mins; and, duration: 1-3 hours. 68. What are the trade names of racemic epinephrine? 69. What is the onset, peak, and duration of racemic epinephrine? Onset: 3-5 mins; Peak: 5-20 mins; and, duration: .5-2 hours. 70. What are the dosages needed when prescribing racemic epinephrine (solutions, mL, and mg)? 2.25% solution, .025-0.5 mL and 5.63-11.25 mg, QID. 71. What are the seven short-acting drugs associated with adrenergic bronchodilators? Albuterol sulfate, pirbuterol, levalbuterol, isoproterenol, terbutaline, isoetharine and bitolterol. 72. What are the two trade names associated with metaproterenol? 73. What are the trade names associated with albuterol sulfate? Ventolin, Ventolin HFA, Proventil HFA, Proventil, volmax, ProAir HFA, Vospire ER, AccuNeb and Airet. 74. What are the dosages needed when distributing albuterol sulfate? SNV: 0.5% solution; 2.5 mg QID; (10 mg for K+tx) and MDI: 90 micrograms/puff QID. 75. What are the onset, duration, and peak of albuterol sulfate? Onset: 15 mins; peak: 30-60 mins; and, duration: 5-8 hours. 76. What are the two trade names associated with pirbuterol? 77. What are the two trade names associated with levabuterol? 78. What is the dosage amount of Xopenex HFA? MDI: 45 micrograms/puffs and TID/QID. 79. What are the onset, peak, and duration of Xopenex HFA? Onset: 15 minutes; Peak: 30-60 minutes; and, duration: 5-8 hours. 80. What is the dosage amount of Xopenex? Adult: 1.25 mg; Ped: 0.63 mg; and, TID. 81. What are the three trade names associated with isoproterenol? Isuprel, isuprel mistometer, and medihaler-iso. 82. What are the two trade names associated with isoetharine? 83. What is the trade name associated with bitolterol? 84. What are the three long-acting drugs associated with adrenergic bronchodilators? 85. What is the trade name associated with salmeterol? 86. What is the dosage amount of salmeterol? 87. What are the onset, peak, and duration of salmeterol/Serevent Diskus? Onset: 20 mins; peak: 3-5 hours; and, duration: 12 hours. 88. What are the trade names associated with arformoterol? 89. Where are alpha-adrenergic receptors usually found when they are stimulated by epinephrine or non-epinephrine? 90. Where are beta-adrenergic receptors found? On cardiac muscles and some smooth muscle. 91. What does Beta 1 – (cardiac muscles) do when stimulated by epinephrine or norepinephrine? They increase the heart rate and strength of contraction. 92. What causes Beta 2- (smooth muscle in the lungs) when stimulated by epinephrine? Vasodilatation of certain vessels and bronchodilation of the bronchial smooth muscles. 93. What are the two main types of classifications that affect the sympathetic system? 94. What do sympathomimetics do to the body? Increase BP, increase HR and Broncho dilate. 95. How do drugs, including epinephrine and norepinephrine, produce contractions of the smooth muscle? They do so by stimulating the alpha receptors. 96. What happens when using drugs containing epinephrine stimulate both the alpha and the beta receptors? Relaxation of the bronchial smooth muscle Beta 2 along with the alpha stimulation effects and the Beta. 97. What do sympatholytic drugs do? They block the sympathothetic system, decrease in BP, and decrease in HR. They are used for: hypertension, angina, and certain cardiac arrhythmias. 98. What is the function of alpha receptors? Generally excite, with the exception of the intestine and CNS receptors, where inhibition or relaxation occur. 99. Where are alpha sympathetic receptors found? 100. What does the stimulation of alpha sympathetic receptors cause? 101. What is the function of beta receptors? Generally inhibit or relax, with the exception of the heart where stimulation occurs. 102. Where is beta 1 receptors located? The heart as it increases the rate and contractile force. 103. Where is beta 2 receptors located? The lungs; bronchial, vascular, and smooth muscle. It relaxes bronchial smooth muscle and vascular beds of skeletal muscle. 104. How does the sympathetic nervous system control bronchial smooth muscle tone? By circulating epinephrine and norepinephrine. 105. What does epinephrine stimulate? 106. What does norepinephrine stimulate? 107. What do parasympathetic vagal nerves innervate? 108. What do vagus nerves in the lungs release? 109. What are short-acting beta 2 agonists (levalbuterol, albuterol) indicated for? Relief of acute reversible airflow obstruction, rescue agents or relievers, COPD and asthma. 110. What are indications for long-acting agents (salmeterol)? Maintenance of bronchodilation, control of bronchospasm, nocturnal symptoms and controllers. 111. When is racemic epinephrine used? To reduce airway swelling after: extubation, epiglottitis, croup, bronchiolitis, and control airway bleeding during endoscopy. 112. How long do ultrashort-acting bronchodilators last? Less than 3 hours. These are epinephrine and racemic epinephrine. 113. How long do short-acting bronchodilators last? 4-6 hours. These are albuterol, levalbuterol, metaproterenol, and pirbuterol. 114. How long do long-acting bronchodilators last? 115. What does epinephrine stimulate? 116. Where is epinephrine stored? 117. What is the onset of epinephrine? 118. What is the duration of epinephrine? 119. What is epinephrine typically used for? Acute asthma, post-extubation, and airway edema. 120. What are examples of catecholamines? Epinephrine, Isoproterenol, Isoetharine and Bitolterol. 121. What are examples of non-catecholamines? Metaproterenol, Terbutaline, Albuterol, Pirbuterol and Salmeterol. 122. How will patients sputum appear after using aerosols of catecholamines? 123. What are resorcinol and saligenin? Increased duration of action (up to 6 hours), may be taken orally and minimal beta 1 side effects. 124. What are the adverse side effects of adrenergic bronchodilators? Tremor, palpitations, tachycardia, headache, insomnia, increased BP, nervousness, nausea, tolerance, decreased PaO2 as O2 is going to airways that are not open yet, hypokalemia and propellant induced bronchospasm. 125. What are tremors caused by? They are caused by the stimulation of beta-2 receptors in skeletal muscle. 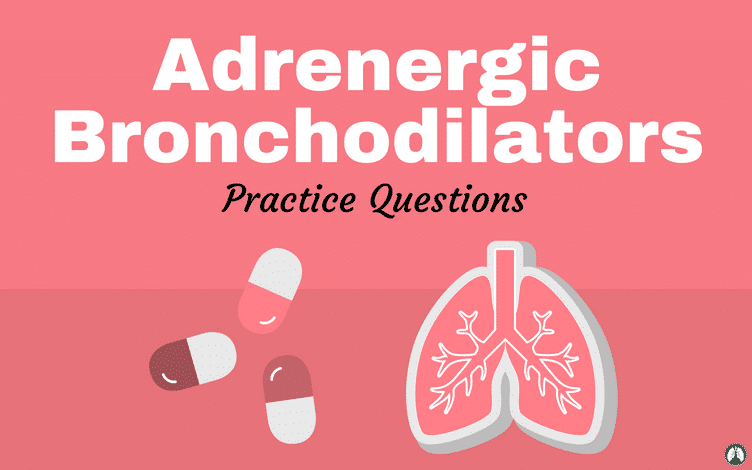 And that wraps up our complete study guide with Adrenergic Bronchodilators practice questions. 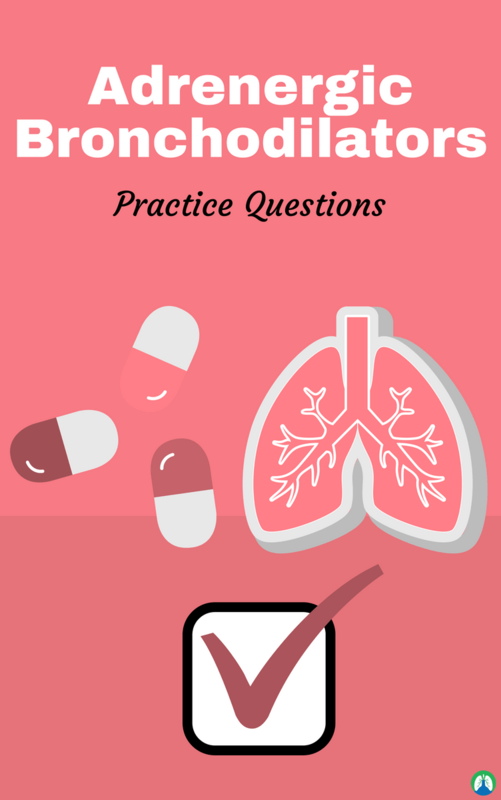 Again, if you can successfully read through these practice questions a few times, I have no doubt that you will easily learn everything that you need to know about Adrenergic Bronchodilators and more. Thanks for reading and as always, breathe easy my friend.